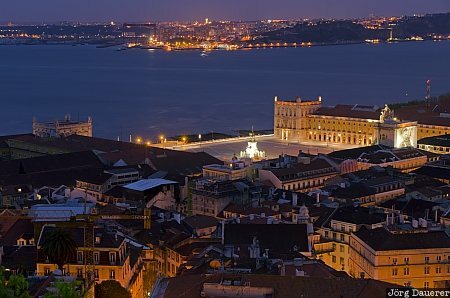 The Praca do Comercio, the houses of the Beixa and the river Tejo in the background seen from the castle of Lisbon (Castelo de Sao Jorge). Lisbon (Lisboa) is the capital of Portugal. This photo was taken in the evening of a cloudy day in April of 2011. This photo was taken with a digital camera.